Google’s incipient and initiating 52 month fractal series conforms to classic Lammert Growth and Decay Fractal Series :: X/2-2.5x/2X/1.6X :: 8/18/16/13 months. The self assembly second fractal to this initiating base is a 108 month (9 year) fractal which serves as the first fractal for an expected 140 year hegemonic US Macroeconomic Asset debt System Third fractal. 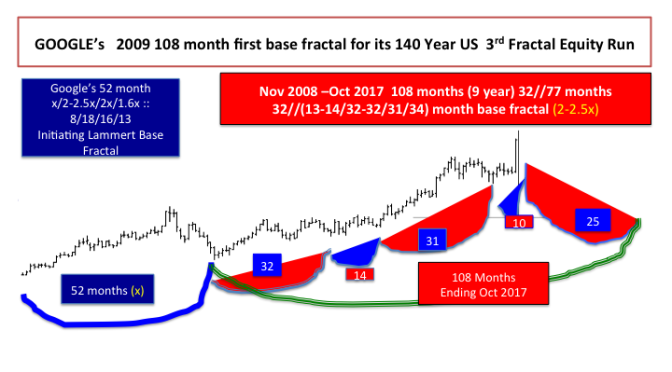 The 108 months span from November 2008 until October 2017 and is composed of a 32/77 month first and second fracatal sub series. The 78 month second fractal subseries is composed of a 13-14/32-31/34 month y/2-2.5y/2-2.5 y series. After October 2008, expansion of the global electronic/papermoney supply, system’s asset valuations, debt growth , and modest job growth was, is now, and will be augmented by an unlimited creation of credits by the central banks. Since this is a global collaboration, currencies relative to each other will continue their relational cyclical fractal growth and decay. Central banks underwrite private and larger banking system debt owed by smaller concerns, e.g., Greece, by electronic means. Paradoxically, for those mired in pre 2009 macroeconomic paradigm, debt will never be repaid but it will never undergo default. Sovereign obligations to contracts with citizens are likewise underwritten. Inflation will be held in relative check by the large amount of debt held by the common citizenry and small natural cyclical fractal increases in interest rates which lower both valuations of held (nondebt and debt)assets. Growth in the SPX is occurring in a y/2-2.5y/2-2.5y manner. Since Oct 2014 a 53 week pattern of 17/37 weeks :: 2/2-2.5x has been self assembling . The first fractal is composed of two fractals: 2/5/5 weeks and 2/4/4weeks for a total of 17 week. The expected 37 week second fractal is composed of the following three y/2-2.5y/2-2.5y decay fractals: 3/7/6 weeks; 2/5/5 weeks and finally 2 of3/7/7 weeks. While the SPX’s final daily fractal series will likely be a Sept/Oct 1929 and 2008 11/27-28/27-28 day :: y/2-2.5y/2-2.5y fractal decay pattern. Oct 2015 ends a 14-15/36 month SPX first and second fractal sub series with appropriate nonlinearity and corrective valuation loss, but not a crash. The current 19 July 2015 SPX daily pattern is 2/5/3 of 4/3 days for an expected base fractal of 11 days, matching the expected base of the 11/27/27 day decay fractall series cited above.